United States History is a required course in Central’s 11th-grade curriculum. However, Central offers AP United States History, or APUSH, for its juniors as a higher-level option. The course examines the origin of American settlers, including natives and the arrival of the first European settlers, to current events. Everything in between, the formation of government and society, the Civil War, World Wars, Progressive movements, assassinations and much more, is covered in great depth and at a quick pace. The course delves into the interactions between people and parties, social movements, international issues, and more. Students ultimately learn what it means to be an American and what it means to live in the “land of opportunity,” what made the country the way it is today, and what role the US played in the formation of its neighbors as well as countries on the other side of the world. APUSH allows students to take their knowledge of history and utilize it to answer AP-style questions and understand why history unrolled the way it did and how history affects our everyday lives. 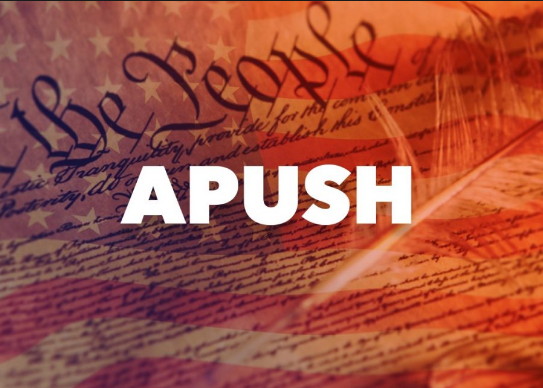 However, many students apply to APUSH with the misconception that the class will be an ‘easy A,’ since US History was a part of middle school curriculum, and the class fulfills the 11th-grade history requirement. This course is much more intense than many initially anticipate and much more work than the traditional history class. Students are expected to put in a minimum of an hour a day during the week, and possibly more over the weekends to fully grasp the concepts. With 41 chapters in the textbook to be covered before the AP Exam in May, the pace is accelerated to nearly two chapters a week, making procrastination impossible and forcing students to stay on top of their work for success. AP History courses have been altered to test the student more on critical thinking and application of knowledge than bland facts, however, memorization and a large amount of studying is still required for the course. According to the College Board, 10.7% of students who took the exam in 2018 scored 5s, with a total of 51.8% of students receiving a 3 or higher. Though APUSH is a challenging course, students are encouraged to take advanced classes, such as this one to become aware of the world and this country, and to become a more well-rounded student. High school is meant to challenge the individual in preparation for the real world and expose one to what it means to be a college student.